Keukenhof is the world’s most beautiful spring flower garden. More than 7 million flower bulbs are planted in Keukenhof every year. It’s definitely a must-see place in Holland! Open gardens and pavilions demonstrate a fantastic collection of tulips, irises, lilies, hyacinths, daffodils, orchids and other flowers. 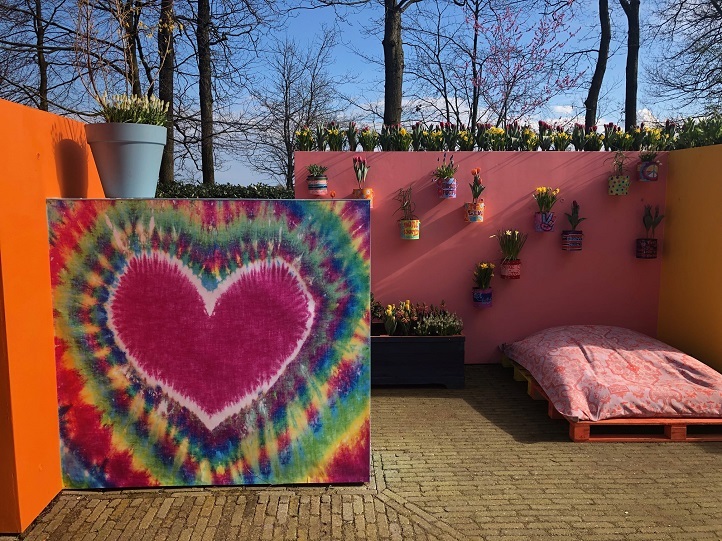 In 2019 the Keukenhof gardens are open from 21 March to 19 May, including Easter weekend (21 – 22 April), King’s Day (27 April) and Liberation Day (5 May). The 2019 theme is Flower Power. Planning your visit to Keukenhof? Make sure you book a hotel well in advance as in April – mid-May Holland is extremely popular among tourists. We advice you to buy tickets to Keukenhof online to avoid long waiting lines at the entrance. The tickets have an open date, which means you can choose any date during the Keukenhof season for your visit. Keukenhof opening hours: 08.00 – 19.30. The gardens are open every day during the season, including King’s Day and Easter weekend. by public transport: bus. Use 9292.nl route planner to find the shortest and the fastest way to get to Keukenhof by public transport. 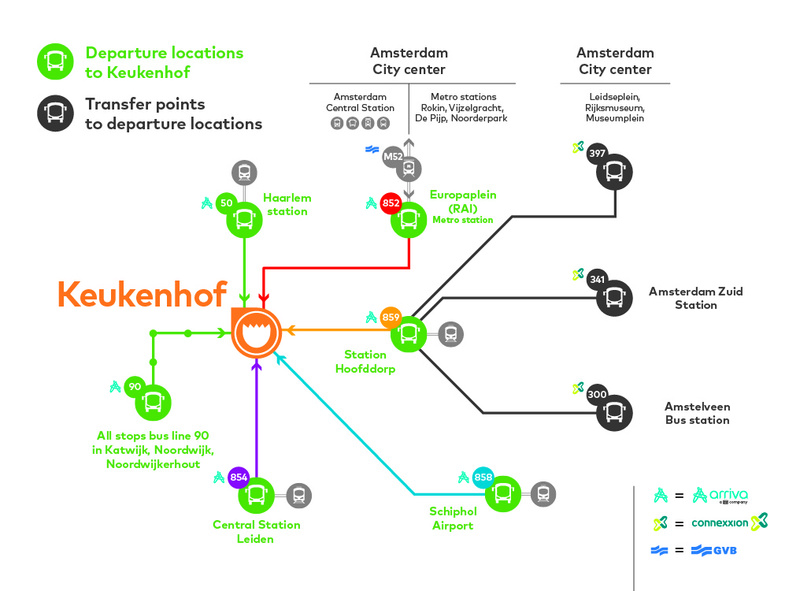 Note that during Keukenhof opening season there are special direct buses (Keukenhof Express) going to the gardens from airport Schiphol (№858), Leiden (№854), Hofddorp (№859), Amsterdam RAI (№852) and Haarlem (№50). You can get Keukenhof combi-tickets (entrance + return bus ticket) for € 30 if you travel from Amsterdam, and € 25 if you travel from Schiphol, Leiden, Hofddorp or Haarlem. From Amsterdam you can take bus line №397 from Leidseplein, Rijksmuseum and Museumplein or bus №341 from Amsterdam Zuid Station. Both buses stop at station Hoofddorp and there you will change to bus №859 which goes to Keukenhof. When you depart from station Amsterdam RAI you take bus №852 which will take you directly to Keukenhof. – bus line 852 from Amsterdam RAI. Travel time 35 minutes. – bus line 859 from Hoofddorp. Travel time 22 minutes. – bus line 858 from Schiphol. Travel time 35 minutes. – bus line 854 from Leiden. Travel time 25 minutes. – bus line 50 from Haarlem. Travel time 40-50 minutes + 10 minutes walk. Please not that travel times can vary depending on the road situation. by public transport: train. Please note there is no train station near the Keukenhof gardens. If you decide to travel by train, you will first need to go to Leiden Centraal station (train tickets are available online) and switch to the bus №854. by transfer bus. Taking a direct bus from Amsterdam can be a good option if you don’t feel like travelling via Hofddorp. The bus departs from De Ruijterkade, 34 (near the Central Train station of Amsterdam). Travel time is around 45 minutes. Prior booking is required. Tickets (€ 39) are available online. by car. The Keukenhof gardens are located between Amsterdam and Leiden. To plan your route use Keukenhof’s address in your navigation: Stationsweg 166A, Lisse. It will take you approx. 40 minutes (sometimes more depending on the traffic) to drive from Amsterdam to Keukenhof. You can park your car near the park for € 6 (you can pay for the parking online). The Flower Parade will take place on 13-14 April 2019. It will start on 13 April 2019 around 9:15 in Noordwijk. Approximately at 15.00 the beautiful cars decorated with flowers will process to Keukenhof and around 21:30 will arrive to Haarlem. On 14 April 2019 the flower compositions will remain in Haarlem. The Flower Parade is an unforgettable show. Don’t miss it! What is the best time to see tulips in Holland? Tulip season runs from the end of March until mid May. Exact blooming times depend on the weather, but tulips are usually at their best in mid April – beginning of May. If you want to see tulip fields in bloom, we recommend to travel to Holland in mid April. Later most flowers are cut, even before they are done blooming, as the farmers mostly grow tulips for the bulbs, not for flowers. Looking for a place to stay during your visit to Keukenhof? When in May is the closing date. In 2018 the Keukenhof gardens are open from 22 March to 13 May. In 2019 the Keukenhof gardens are open from 21 March to 19 May. Every day? Yes, every day from 21 March to 19 May 2019. I will reach Amsterdam only on 19 May morning, the last day of the flower exhibit. Is it still worthwhile to go Keukenhof Gardens? Will there still be many flowers to be seen? 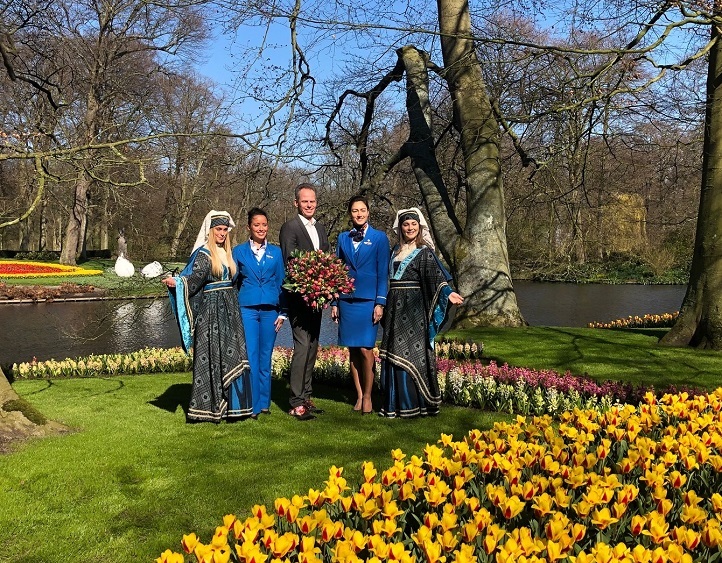 The Keukenhof gardens are open every day from 21 March to 19 May 2019. 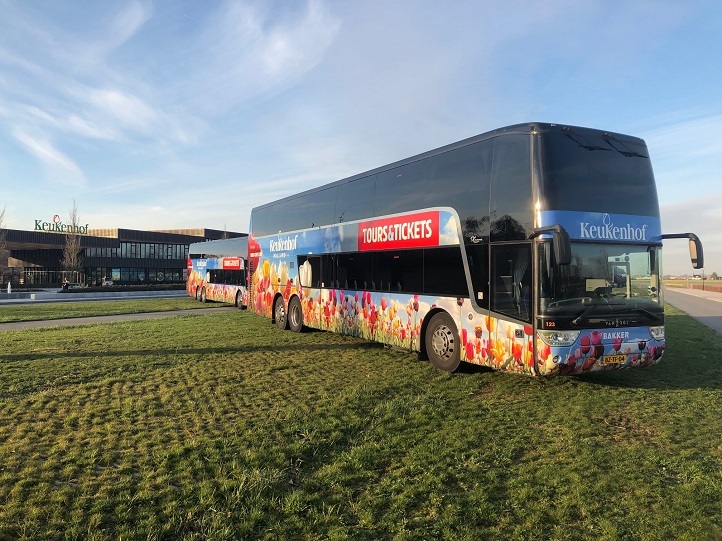 Is there any buses to Keukenhof on 13 April 2019? Hi! Do I have to book an exact time to travel via bus from Schiphol to Keukenhof? Or is it not necessary? Thanks! No, with this ticket you can travel on any date and time during the Keukenhof opening season. Yes, Olympisch stadion stop is inside the traject where the combi ticket is valid, so it should be ok.
Will the public transport available on 13th april? Is the bus ticket valid for any date if I get a combi ticket? Can I return on a different date? A combi-ticket (entrance + bus) is valid for one day. So no, you cannot return on a different day. If you booked it with Tours & Tickets, 9:30 is the earliest time available. Hello, what is the difference if I will choose Combi-ticket vs Keukenhof half-day tour? If I will choose Combi-ticket, will that allow me to roam around the Keukenhof Garden? You can check for the difference here http://holland-explorer.com/keukenhof-gardens-tickets/ (see What type of ticket suits you best?). I’m not sure what you mean by roaming aroung the gardens, but a combi-ticket includes transportation + an access to Keukenhof for the whole day. Does the park work on Easter holidays? Is the schedule the same?What is the working hours on the Easter? Would you know what dates this will be open in 2020? Not yet, but they will be announced within a month, by the end of 2019 season.